Do we ask the Council to lease it commercially and get it as a café (with a toilet for public use), or do we ask them to demolish it? Voting closed on the 16th Sept. There were 74 responses; 83% in favour of a commercial let and 15% in favour of demolition. We have passed this info onto the Council. The toilet block is a headache. We’ve been working on plans for this for 6 years now. Our members survey of 2016 (see the results here) showed that converting it to a café was clearly the most popular of all the improvements proposed, scoring 89% in favour. We then secured agreement from the Council that we could lease it at a peppercorn rent and then sub-let it to a commercial operator – we had no interest in running the café ourselves. We were funded to get planning permission, plans dawn up and prices in. There were but two agencies who were even prepared to consider funding the work through landfill tax monies, but competition was huge. The Lottery was out, because we wanted to sublet the building. We discovered that it would be very hard to raise the £70,000 we’d need. The 9 builders who indicated an interest in bidding – most met with our architect, then chose not to give us quotes. After a year of chasing. We had but 2 quotes, but couldn’t even submit an application until we got the 3rd. Prices were £62,000 and £77,000 – double what we’d originally estimated. Needless to say, throughout this period the toilet block has continued to fall into greater disrepair, with harling falling off, timber rotting (there is a water leak inside) and trees growing out of the roof. FoRP were reaching the stage of believing they would have to give up, when a resident approached us, indicating he would be interested in taking on the project. He and his partner indicated they would put in some capital and get a bank loan for the rest. We are keen for him (or another businessperson) to take over the toilet block and make it into a café. We believe there is so much risk involved in the building that builders and funders are really not that interested. The building is in such poor condition that builders are unable to see exactly the condition of the walls and roof without carrying out the work; giving a fixed price in such circumstances is clearly a risk most builders were unwilling to take. The very high competition for scarce landfill tax monies mean that an application of this nature stands a low chance of success, since most grants go to play facilities and amenities currently in use (the toilet block is in a flood plain, also). We therefore felt it necessary to draw this project to a close and notified the Council we have withdrawn our interest in leasing the property. We’d now like to persuade the Council to lease it commercially on a 25 -year lease at a low rent. 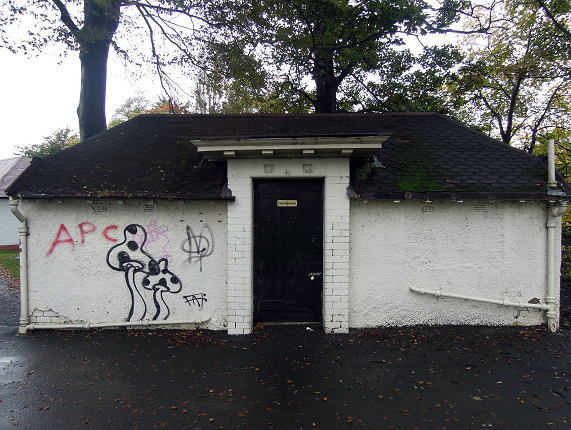 There are examples of disused Council buildings on park land that had been refurbished by commercial operators. The Gardeners Cottage café in London Road Gardens is a good example of what we aspire to. 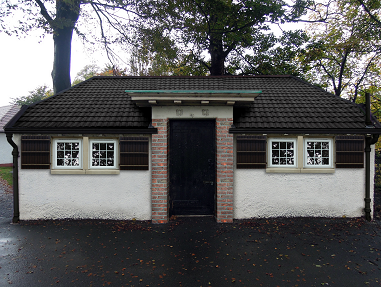 The Lodge Coffee House in Braid Park is another. The Council, due to austerity cuts, has no money to refurbish the building and that situation will continue for the next few years, at least. We doubt we shall ever see them ploughing £70,000 into it. We asked Andy Wightman, Lothian MSP and noted authority on land ownership who has championed the protection of public land, what he thought of our proposal. His comment was “I don’t have strong views – it’s up to local community & council. Seems a reasonable proposition to me.” Local Councillors Frank Ross and Gillian Gloyer are in favour too. Fields in Trust had no problem with a commercial let. We shall now work with the Council to have it let commercially, on a peppercorn rent with a long lease and the possibility to sublet, similar to the terms FoRP were offered. “we now have a contractor in place to undertake the play works in the park. The Council Officers said to use that they had no specific plans to extend the white lines over the whole of the route in the park (at present they are just on the approaches to the centre). But if you have views about that possibility we suggest you air them. There is also a bit of intro which you can check it out here: Roseburn_Park_Trial_Consultation_Summary_Sheet. Edinburgh Rugby (the professional club) have submitted a planning application for a 7,800 capacity stadium on Murrayfield’s back pitches. The relationship between this development and the ejection of Murrayfield Wanderers (the non-professional club) from Murrayfield is unclear. Murrayfield Wanderers are controversially interested in relocating to Roseburn Park. Artists impression of Edinburgh Rugby’s plans for Murrayfield stadium back pitches. 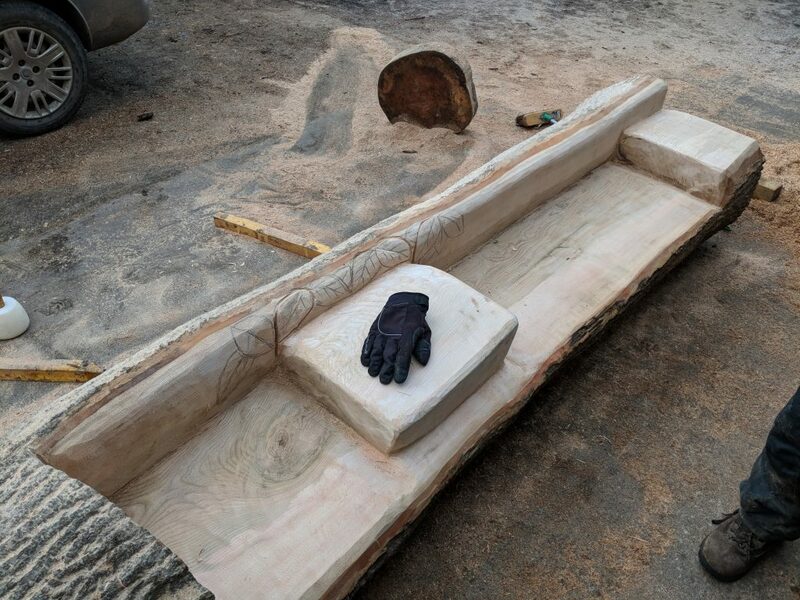 Work has begun carving a bench out of a log to be installed in Roseburn Park to mark the park’s new beginnings following the Flood Prevention Scheme. 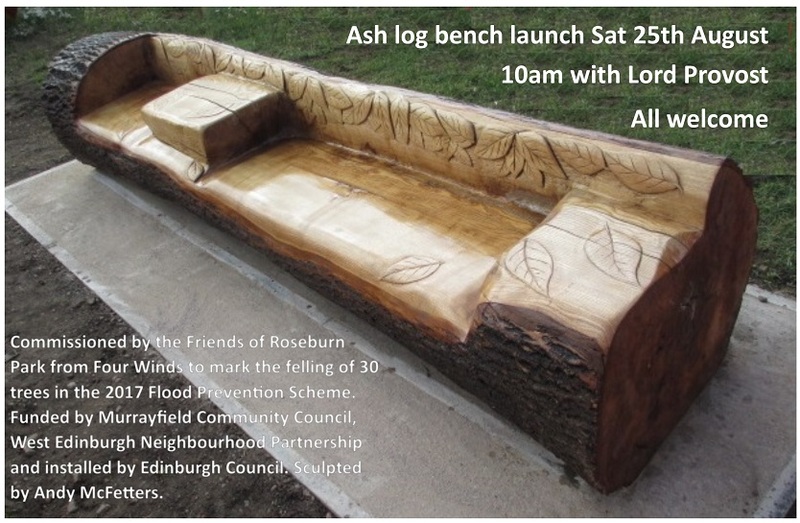 The bench is being organised by Friends of Roseburn Park and is sponsored by Murrayfield Community Council and the City Council’s West Neighbourhood Partnership. 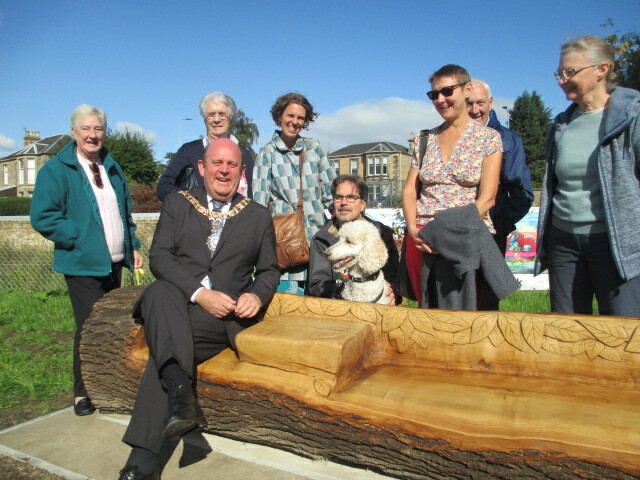 The work is being undertaken by Four Winds Edinburgh. We have been given 1000 Daffodil bulbs and these need to be planted quickly in the park. Can you help? We have organised a ‘drop in’ event starting 10 a.m. through to 3.30 p.m. on Sunday 17th December at the Armoury building. While some gardening tools are available, it would help if you could bring your own. Tools such as spade, trowel or dibber would be useful. Bring friends and family. 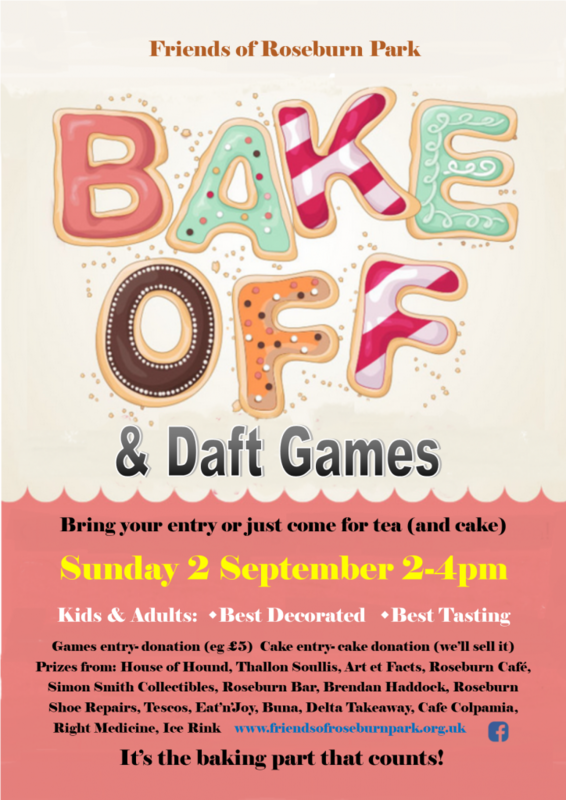 All ages welcome including accompanied children.